Recent studies suggest that diet may play a major role in overall and long term mood, emotion regulation and well-being. Considering how your diet may influence your mood as well as monitoring how certain foods or dietary changes may affect or change your overall mood or emotional well-being can help you to lead a more balanced lifestyle. Many studies highlight the relationship between exercise and emotional and psychological well-being. Current research also emphasizes the link between diet and overall psychological well-being. Unhealthy eating habits and poor diet is linked to various long-term psychological and mental health concerns, including; depression, addictive behaviors, and stress. New research in mounting on how what exists in your gut impacts your brain chemistry. Our gut is filled with trillions of bacteria which help us digest our food and process the energy and nutrients that we need. When this natural system goes awry, it can impact our brain chemistry. Although research is still being conducted to figure out exactly how, when we look at studies done with individuals who have bowel and intestinal disorders there are strong links to their health conditions impacting how they feel emotionally. A new field of research on the food-mood connection is emerging and we soon hope to know more. We know now though that the possibility of a link is likely, Therefore, it’s important to eat right if your hoping to feel good! 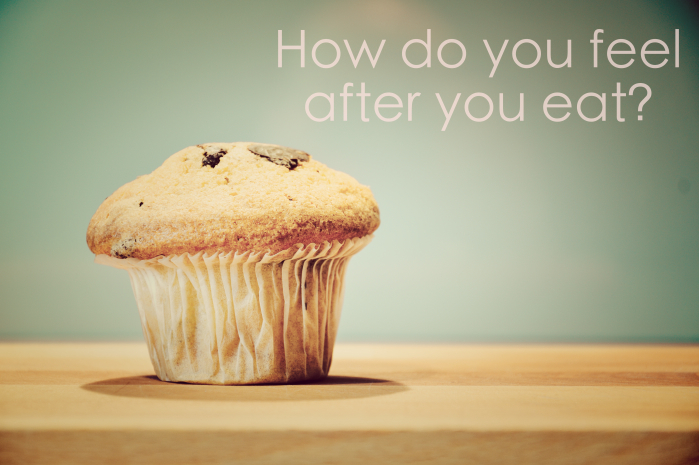 Mindful eating for psychological health requires attention to when, how and what we eat. The quality of the food we eat is essential for both the physical and psychological nourishment the food provides. A well balanced and nutritional diet can help in regulating emotional states, overall mood, energy level as well as aid in problem solving, decision making and stress level. Eating fresh, organic food that are nutrient rich puts us in the best position to impact our moods. There are various ways to incorporate psychologically healthy eating habit into your daily routine. Eating well balanced meals throughout the day can help maintain blood sugar levels, reduce cravings and unhealthy snacking as well as maintain a stable mood. It is essential to eat a balanced breakfast to start the day on a positive physical, emotional and psychological note. Drinking plenty of water maintains hydration and can further aide in maintaining mood throughout the day. Protein rich snacks and meals reduces unhealthy cravings and eating habits while ensuring your body receives essential nutrients and nourishment. Lastly, cutting out fast-foods and processed foods is key. Think about what is happening in your gut as your body tries to break down these toxic foods. You can notice quickly that your energy is drained and upset stomach symptoms impact your mood dramatically. You start the feel sluggish. This reaction is particularly problematic in individuals who experience symptoms of depression already, you are setting yourself up to feel even worse if you continue to put bad food into your body. Start with small tweaks to your diet to improve your own food-mood connection! If you pair this with exercise, the effects can be doubled for you! Be sure to consult with a doctor or nutritionist if you have any concerns about making dietary changes prior to starting. Goldberg Briggs, Katherine. Retrieveed from: http://www.depressiontoolkit.org/news/food_and_mood_connection.asp. Retrieved: July 2nd, 2015. Iliades, Chris MD. “6 Ways Food Affects Your Mood”. Retrievd from: http://www.everydayhealth.com/news/ways-food-affects-your-mood/. Reteved on: July 2nd, 2015. The Institute for the Psychology of Eating. Retrieved from: http://psychologyofeating.com/food-mood-connection/ . Retrieved on: July 2nd, 2015.